I had been looking forward to this drama SP quite a lot. 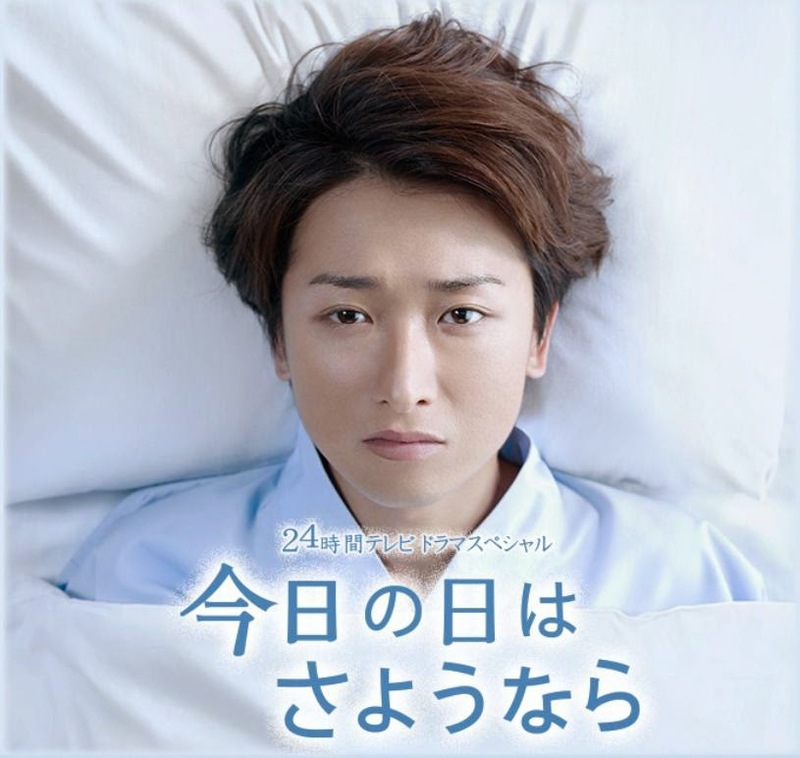 The promotional CM's showing Ohno in the beanie, looking helpless and frail as he lies on a bed or slides into an MRI machine really caught my eye because a) I'm a sucker for 24-Hour TV Specials, and b) I've always thought that Ohno had just the perfect look to star in one of these. He's not an actor with a particularly wide range of facial expressions, but it's something about the weariness in his "default" face, the lazily hooded eyes, the slight melancholy pout, and the tendency to look down at his feet that makes him so suitable to play a quiet boy-next-door character who suddenly finds himself having to deal with the arduous process of dying. Ohno has a good victimized look, which is not to say he's bad at playing villains because he did so beautifully in Maou, but the moments in which he really shines dramatically are the moments where he shows his vulnerability. Even in Maou, the best scenes were when you could see his self-loathing and the hopelessness in his eyes as he tells himself that there is no other way. (shivers). Being a fan of Ohno, I think that people like him not only for his talent, but also for his aura of innocent vulnerability; I know my maternal instincts (yeah yeah I'm only like 23 years old, but I can still have maternal instincts, okay?) tend to crush my ovaries together at the mere sight that dazed little Fishing Riida. But back to Kyo no Hi wa Sayonara. I set aside some time one night to watch it. I locked my doors to ensure absolute solitude, turned off the lights, grabbed a box of tissues and pressed "play." Because hey, no one should ever interrupt the sacred viewing of an Ohno drama. Two hours later, I sank back into my couch with a long sigh, emotionally exhausted from that steady journey to death. This wasn't a suspenseful drama; there was no doubt that Kouta would die in the end, but the beauty was in the way every step of his inevitable dying was narrated to us through his thoughts, and as plaintive and melancholy as it was, one can't help but feel a sense of hope and peace at the end. The message that Kouta leaves behind on that paddle-boat resonates powerfully with the actions of his family as their lives go on in the final scenes: Death is not the end. Fujioka Kouta (Ohno) is a young chef, just starting to get recognized by his superiors at his workplace. He has a sincere girlfriend Etsuko (Kimura Fumino) and a gentle, happy family. One night, after he takes Etsuko home for a relaxed meal with the parents and his sister, he walks her back to her home, and we get the sense that they are at a point in the relationship where they're completely comfortable with each other. There's some talk of his sister being proposed to (and here I melted at the totally pregnant pause in their conversation). As Kouta walks back though, blood starts dripping from his nose. He falls to the ground, and when he next opens his eyes, he's in a hospital. We find out that Kouta has lymphoma, and that his chances of survival are 80%. He needs to stay at the hospital and undergo chemotherapy right away. He processes the news somewhat pessimistically at first, thinking 'That means that 1 in 5 people will die." But after playing a little lottery game with a vending machine, he hardens his resolve and becomes more determined, saying to himself that "It also means 4 out of 5 will live." Kouta shaves his head, smiling at his girlfriend, and undergoes the chemo, his family and girlfriend tending to his every need every step of the way as he gets weaker and weaker from the treatment. Soon he has lost his appetite, and is constantly vomiting. One night, a patient from next door (Yamada Ryosuke from Hey!Say!Jump!) hears his retching and brings him a lemon, saying that the scent of it helps with the nausea. Dazedly, Ohno takes it and thanks him. The next day, we learn that that patient's name is Harada and that he's been in the hospital since he was 14 due to some form of cancer. He takes Kouta on a little stroll around the wards. They visit sick (but still adorable!) children, and Harada reveals that he has actually lost a leg. He lifts up his pant leg to show a prosthetic. He also shows Kouta a discolored patch of wall where he had written grafitti in his younger and more rebellious days. Then, he takes Kouta to the psychologist Ookubo (Fukada Kyoko), who he seems to have a little crush on. They play Babanuki and Kouta loses. But he's having fun and relaxing and the atmosphere between the three is a peaceful, friendly one. Kouta goes back to the hospital for his check-up, and the continuous string of bad news starts to hit. The chemo wasn't as successful as they had hoped and now his odds of survival are only 40%. Poor Kouta tries to stay positive with his parents, but all words of reassurance ring hollow now. His girlfriend stops visiting him after receiving this devastating news, broken by fear. Kouta's sister prepares for the transplant operation, and her boyfriend/fiancee-to-be is very understanding of the toll it may take on her body. Kouta feels slightly guilty for how this is interfering with her plans to marry, but she smiles and says it's nothing. 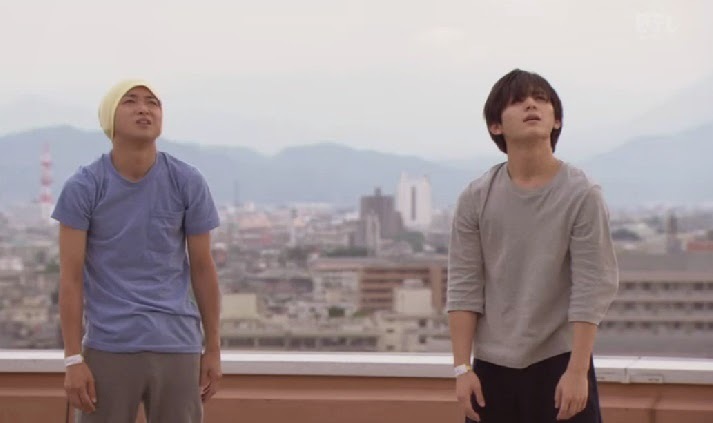 One day, Kouta and Harada go to the rooftop to do their morning exercises, only to find that Breathing-san, an old patient who does exercises there regularly with the hope that it'll lengthen his life, is now gone. He had passed away. Harada tells Kouta that he was the 48th person he knew who had died since he entered the hospital. Kouta looks disturbed that Harada actually counted. In response, Harada takes Kouta to his "secret place" - the hospital's morgue - and points to one of the wooden boxes there. "Breathing-san is in there now." He then starts to wax philosophical on how all men must die in the end. Kouta is visibly uncomfortable, and runs away. Harada rests his head on the head of a box and sighs in the quiet of the morgue alone (some pretty pretty Yamada Ryosuke there, but not gonna lie, that scene and his character creeps me out a bit). More bad news follows. The new chemo treatment plan hasn't worked, either. They are now going to have to be more aggressive, and the doctor decides to proceed with the transplant without delay. Kouta's chance of survival is now only 20%. Devastated, he weakly wonders aloud to his family if there even remains a chance for him to live, if it's really worth all the money and time they're spending on him. His family stoutly asserts that they would do anything in their power for him, but Kouta replies that that only adds to his stress. Kouta, Harada and Ookubo pay another visit to the morgue, where they bond and share their innermost insecurities. Harada reveals that he would rather spend time in the peace of the morgue and contemplate how all comes to an end with death than visit the newborn ward where life abounds. Ookubo reveals that she became a psychologist because she still lives in the shadow of her boyfriend's sudden (and completely unpredicted) suicide. The transplant is done, and Kouta is put in a clean room to recover. Harada visits and tells him about how he stood out on the street with the prosthetic leg exposed and got donations from passersby. He donated it all to charity. We get another philosophical moment from Yamada, as he talks about the only thing he desires - life. Kouta has a beautiful dream where all his acquaintances and family are gathered on a grassy meadow to have a luxurious sashimi meal. The dream is filled with laughter, light and camaraderie. Kouta is then released from the hospital and quickly settles back into his old rhythm of life, making food for his family, playing with his dog and writing an illustrated recipe book. He gets a mail from Harada, which begins with "Hello, are you still alive?..." and ends with "Today, I am still alive." Harada talks about how he's growing and his prosthetic had to be adjusted to fit his growing height. There's a note of hope in his mail, and Kouta smilingly thinks of what tomorrow would bring as he puts away his phone. The Fujiokas go away on a trip to a seaside resort, and we're treated to all these sweet scenes of family companionship as they enjoy time together. Everything seems as though it's back to normal. Until Kouta breaks down with another severe nosebleed as they're all walking down a seaside road and reminiscing on old times. Kouta's father practically commandeers a passing van and drives them all to the nearest hospital, where it is confirmed that the cancer has recurred. Kouta knows that this means his transplant didn't work, and that there is now no cure for his illness anymore. He opens his eyes to find himself in an unfamiliar hospital bed with his father's head sleeping on the side of his blanket. "Sorry, father," he says in a subdued voice. "Everything didn't turn out to be okay." Kouta meets Harada and Ookubo by the lake where he used to go paddleboating with his girlfriend. Rain is splattering down on them, but the sky is light and the atmosphere is fuzzy with soft pastel colors. Kouta wonders what the right way to face death is. He asks what he should do right now with the remainder of his life. Ookubo gently asks him to think about what he wants his loved ones to remember him most by. 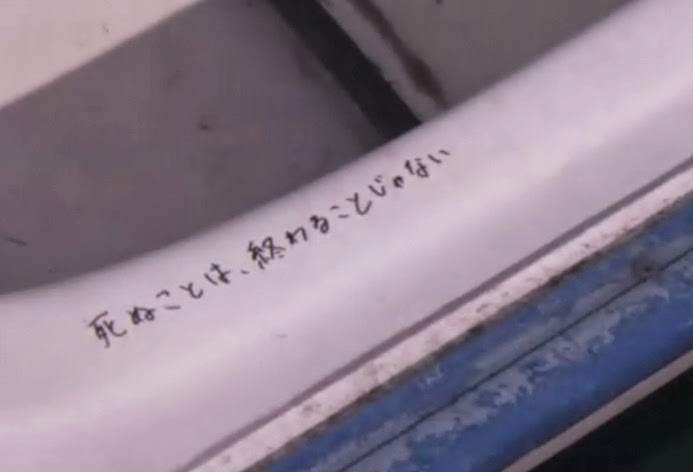 As if inspired, Kouta kneels down to the paddle boat in front of them and writes a little phrase on the side of it. The other two look on with faint smiles. Kouta then meets with his doctor, alone this time, and asks him, "Death isn't the end, is it?" The doctor (who, by the way, has the most deadpan face in the history of Arashi dramas) acknowledges it with a solemn "Yes." and then proceeds to talk about the next steps in Kouta's care. Kouta has three more months to live. The air around the Fujioka family table is heavy. Kouta thanks his sister for donating her marrow and allowing him to live until this moment, but he also reveals that he does not wish for more treatment, that at this point, further chemo would only mean more suffering from the side effects. Kouta's face is sorrowful, but he seems to have accepted his impending death, even though his family is still coming to terms with it. His mother begs him to reconsider. His sister reminds him that his life does not belong to him alone. But Kouta sticks to his decision; he knows his body best, and he knows that more treatment is futile. His mother looks at him with pleading eyes, imploring him to fight on, but what comes out of his mouth is "Gomen." Then comes one of the most heartwarming and heartbreaking scenes in the entire movie. Kouta recalls to his family how they used to go paddleboating on the lake when he was young. He would sit on his father legs because his own legs were too short to reach the paddles. Then, as he grew older, he and his sister would compete to see who could paddle faster. In those days, he would offer to paddle in place of his mother and would secretly think to himself, "Ah, if I paddle then Mother won't have to tire herself" and it would give him comfort to know that he could be a good son in that way. But now, (and Ohno's tears are starting to flow here) Kouta is filled with self-blame because just when he was hoping he could finally stand on his own two feet as an adult and begin to look after his parents as a good son should, he gets cancer and can't be anything more than a helpless patient. His voice threatens to break when he tells his tearful family that even though he can only do this with their help, he wants to spend the rest of his time here at home, surrounded by the smiling faces of his loved ones. He finally does break down with his final "Gomen. For having to die first, without fulfilling my duties as a son..." His father takes a deep breath and nods, comforting him with his catchphrase "Daijoubu da." His mother and sister are teary but respect his choice too. The end-of-life preparations are underway. Kouta and his mother meet with specialist doctors and nurses who will monitor him as he stays in his home, and when alone, Kouta begins to recall all the things he loves about his family members, quietly storing these final images of them in his mind as he prepares to face the unknown. He decides to resolve his relationship with Etsuko, too, so he goes to visit her at her peach orchard. This is another beautifully subdued scene. He just wanted to thank her and tell her that they were even, that even though she ran away from him, he had also always been running away from facing her. He didn't have the courage to chase after her. He smiles faintly, wistfully at her, and asks for one of her peaches in a casual nostalgic way, then bids her goodbye and walks back down the dusty country road. She watches his receding back; we never actually find out if she knows that he is terminal at this point. Kouta writes letters to each of his family members and entrusts them to Ookubo. He wants them to be delivered after his passing. Half-jokingly, Kouta asks if she wants him to pass a message along to her deceased boyfriend when he gets to the other side. Ookubo has an emotional monologue culminating in her declaration that she would live well from now on just to prove her strength to he who abandoned her. Ohno nods and smiles. "Take out... this tube... please." Kouta's body is becoming frailer, and he is soon bedridden and can only be fed by tubes. Speaking becomes a task requiring effort, and most of the time he is on painkillers. Finally, the day comes when he recognizes that it's time. As the doctor leans in to his bed, Kouta speaks out raspingly. "Take out... this tube, please..." His mother's face registers the the most perfect look of panic and grief, but Kouta knows what he's doing, and after the doctor talks it over with his family, the tube is removed. Kouta's body deteriorates over the next couple of days, until at last, he feels his life slipping away. His family gathers around, and with his last breath, he asks his customary phrase haltingly: "What's for dinner?" His mother clasps his hand and chokes out "Steamed egg." Kouta's lips curl slightly into a smile, and then his eyes close. The doctor steps in, checks his vitals and pronounces him dead. Back at the hospital, Harada is still doing morning exercises, albeit all alone. Ookubo finds him and informs him of Kouta's death, saying that he died smiling. Harada smiles, his face turned up. We see him visiting the newborn ward soon after. Kouta's family continues to live on with the memory of their son embedded in places all over their house. His parents, at the suggestion of Kouta (in his letter), go on a date together again. As they paddle their boat around that familiar lake, they notice a little phrase scribbled on the side of their boat. Death is not the end. His sister makes a dish that was left behind in Kouta's recipe book. Life is not the same without Kouta, but the Fujiokas are living strong with their loss and treasuring every little bit of Kouta left to them. What a strangely peaceful tearjerker. Unlike Nino's 24 Hr SP, there was no great conflict between the characters, no interpersonal tension to be resolved, no weak mothers to be forgiven by rebellious sons... Kouta's relationships are all comforting and warm. Everyone is nice and accommodating to him. No one's a villain. The real conflict here is entirely internal. It's a face-off between Kouta and Death (side note: who would have thought that less than a year later, Ohno would be playing Shinigami-kun, a harbinger of death in a dark comedy? *wink* I wonder if he thinks back on his Kouta role as he hands out the "notice of death" during the shooting for this new drama? ), and even this face-off isn't exactly antagonistic. If anything, it's about Kouta gradually coming to terms with Death, accepting it, and finally embracing it. Some might find this drama to be a bit staid or (for lack of a better word) boring because of this lack of action, but if you're a keen viewer, you'll find all these beautiful subtleties in the emotional journeys of the characters (okay, mainly Kouta) that will stick with you for a while; after all, the message of the drama is a pretty deep one that will resonate with everybody, regardless of how sick or healthy we are, since it's one truth that we all have to face: Death is not the end. And how Ohno pulls that message right into our hearts is just amazing. As I said before, Ohno is a superb choice for Kouta; he's passive, he's quiet, he's shy about expressing his feelings, he's got a calm exterior but is capable of showing a wide range of emotions when called upon, and most of all, he just has that natural innocent-boy-next-door look that is so powerful in evoking that "Why does it have to be him?" sentiment in viewers. Ohno can break our hearts with this sort of role because he can make what seems so everyday and normal something worth mulling over and treasuring. Ohno-as-Kouta made me think twice about every family photo I took, about every dish my mother cooked for me, about every movement in my old morning exercise routine in Chinese school back in the day... To me, those moments had passed swiftly, leaving barely an imprint on my mind, just something that happened every day, but this drama SP is one of those things that make you revisit such moments. Perhaps to me, the morning exercises were a silly nuisance, but to a cancer patient who has no hope of a cure, going through even these motions may be like a safety blanket, a method of self-reassurance (or a comfortable way of self-delusion), the only last thing they can do to stubbornly tell themselves there is hope still. Ohno's acting is delicate, as his character is for the most part sedentary, and you won't catch his subtleties watching the drama half-awake with a beer in your system. Underlying his every expression is a veil of regret; that's one emotion that never leaves his face, but as the drama progresses, we do get to see lots of other complexities dance across our Satoshi-kun's poised features. Before the illness, Kouta is pretty much just... Ohno, a man of simple desires and small ambitions, content with his provincial life and the comforting intimacy of family and friends (and dog). 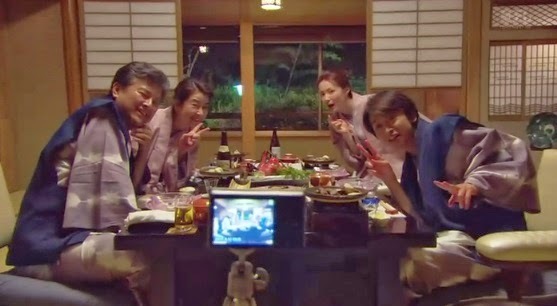 The easy way he interacts with his family in those first few scenes could just as easily have been any Ohno-Arashi interaction, with a member trying to get a word from the reticent Ohno by teasing him, and Ohno keeping his attention firmly on his food and responding only with "Urusai yo!" Because of course, both Kouta and Ohno would usually rather be left alone to enjoy their gyoza/ramen/fish than to have to deal with talking (though we all know that Ohno's heart secretly burgeons with warm fuzzy luuurve when his bandmates shower him with attention, but that could just be my delusion). For some reason, Kouta's looks of fond annoyance, the kind only reserved for siblings, hit me really deep in the heart. It's these sorts of expressions that are truly characteristic of a happy family, I think, and whenever they occur in the movie (mostly between Kouta and his sister), my heart just feels ripe to burst because this is possibly the most perfect example of what an ideal sibling relationship should be: fun, teasing, at times a bit squabbly, but always selfless and loving when real problems come up. At the first stage of his illness, we see the first lines of worry and anxiety cross Oh-chan's melancholic face, which is just so beautiful I can't even. Good job, cameraman, on all those devastatingly heartbreaking close-ups. Ohno's acting is flawless in these types of roles. I loved the way he avoided his family's gazes so they wouldn't see the uncertainty in his eyes, I loved how hard he was trying to stay strong in front of them. And I absolutely loved that scene with the vending machine, when Ohno plays the lottery game. The swift, disbelieving sweep of his eyes from side to side as the congratulatory tone beeps mockingly across the empty room speaks volumes about what just every cancer patient must feel at times, that their life was nothing but a misstep in some grand cosmic lottery, and that nothing they do really matters, that they're all just withered leaves passively borne to wherever the currents take them. More props to Cinematographer-san for the shot of Ohno's distressed face through the blurred reflection off of the vending machine. The cold blue light, the echoing clunks of the prize can, the stillness of everything in the picture except for Ohno's panicky eyes... Ahhh I am no pro at movie-making, but as a viewer, I think my heart broke a bit. But Ohno leaves the vending machine with determination and hope. It also means that 4 out of 5 will live. He would defeat the cancer, he believed, and he would endure whatever nasty side effects to do so because he wanted to be strong, for his family, his girlfriend and himself. The look on his face as he abruptly walks back down the hallway after thrusting the cans he won into a surprised Ookubo's hands almost reminds me of Naruse-sensei in how hell-bent he seems on his goal to fight and finally win over the cancer. It's striking how the otherwise gentle Kouta shows so much clench in his jaw in this one scene. You can really tell that he wants badly to fight for his life, and even though he's all smiley and reassuring to his mother and girlfriend as they take care of him in the hospital, you know, because of this scene, how much fear and determination is actually encased in each of his smiles. "Gomen. For having to die first." As the odds slip down, frustration and despair are the dominant players on Oh-chan's face. Kouta is lost. He doesn't know what to do with himself. The numbers seem to be egging him on to his death and nothing he does can stop it. He finds it hard to live with the fact that he is now more or less a burden to his family, and he tries not to dwell on Etsuko's desertion (which was so sad; I mean, he wanted to marry her! And he never even got a chance to tell her T.T). Family love is unconditional, but as with anything, one becomes uncomfortable when someone is giving more than they can give back, and our despairing Kouta feels that now, he cannot possibly give back all the help his family has given him. The beautiful part (and the lesson here) is that because it's family, he doesn't actually need to, but then again, because he loves them, it is also invariably correct that he should feel the need to. Seriously, all the kazoku-ai in this drama (and who better to play it than our resident Mama's Boy?) is making me weep oceans inside. In the final three months, after the teary family talk, the acceptance settles and Oh-chan's delicate features relax as the dignified progression to the end begins. He wishes he didn't have to leave his family, but he accepts the cards Fate dealt him. He still has three months after all, and he will use them to make sure that his presence continues to linger on in a positive way afterwards. The colors become warm and peaceful, though the melancholy never leaves the air. We see Ohno bathed in golden sunlight as he rummages through his old box of memories, and there's, of course, that scene in the peach orchard with Etsuko that I cried several times over (and still do, upon a rewatch). One of the things I love about this drama (and MatsuJun's Hajimari no Uta is similar in this regard) is how real it is about the issues in life. While most dramas/movies neatly tie up all the loose ends of every plotline by the "owari" mark, Kyo no Hi recognizes that a lot of times, we're forced to leave things unresolved, because in real life, there's not just the happy ending or the sad ending, there's also the indefinite ending, where nothing seems to have changed substantially after the revelation or confession. It's like that with the Kouta/Etsuko plotline here. He finally admits his weakness to her, and she begs forgiveness for running away from him, but speaking these feelings out loud changed nothing. It made them both feel a sense of closure, but did it lead to an outpour of emotions where they cry out their love for each other? Did it bring Etsuko back to Kouta's side for the last few weeks of his life? No, and no. The only thing we see is Ohno lightly taking a peach from Etsuko's basket and walking away with a faint smile. We honestly don't even know if Etsuko is aware of how long Ohno has left to live. But I guess that doesn't matter. Its's implicit that he's going to die sooner rather than later. The peaceful atmosphere in a scene of such high emotional tension brings home the readiness Kouta feels towards death. He fears it no more. In fact, he takes it in his stride now, with sadness, sure, with regret, definitely, but he knows that death is not the end, because life still goes on after death, and he wants his loved ones to be able to go on well after his passing. Those letters he wrote to his family, the recipe book he worked on, the last meal he cooked for them... he left life with a smile, content at having finally realized that his value to his family would linger on for as long as they lived. If I ever get advanced notice of my death, I would want to go with the same dignity, the same peace, the same contentment as Kouta. 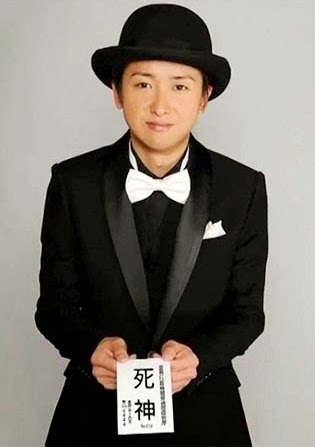 God, Ohno, I am so looking forward to how you'll portray Death from the other side as Shinigami-kun now. Hye, honestly, I was scared to watch this. Because it was Ohno. Thank you for our recap so I can understand the whole story. Watching people dying in any drama, it was okay. But when Ohno I guess I can't because his image as Uta No Oniisan are strong makes make somehow can't watch it peacefully. But after read it I think I can give another try. I also watched Matsujun and Nino. Personally I like Nino because it was so real and give me a big impact on our current society and social problem, sounds heavy right? Anyway, this is post about Ohno's drama, not Nino or Jun. Lastly, thank for the recap, and it is awesome. p/s His Maou also take me around 1 year to rewatch the drama again. Such a big impact on my emotion. 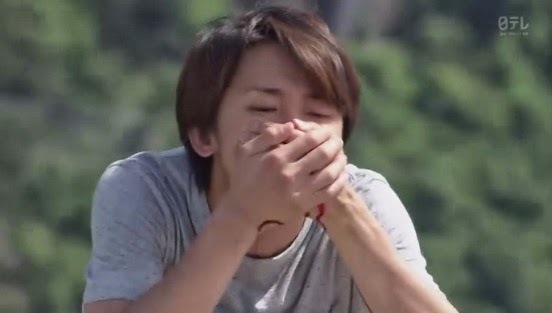 I can understand why you'd be scared to watch this, because no one would ever want to see Ohno dying, even in fiction! But I honestly think that this drama SP portrayed the process of dying with such peace and dignity that it actually felt all right to give a little smile through your tears when the ending came, because even though Kouta had many regrets about unaccomplished things in life, he died with the love of his family bathing him and it was just so beautiful. I liked Nino's too! That scene on the cliff where he wants to commit suicide T.T I cry every time.